I like suggested detail, as in the group of workers in this painting. The saying ‘less is more’ really does apply here. It seems to work best for me in ‘alla prima’ painting. In this painting the strip of dark brown (Burnt Sienna and Prussian Blue) which ran across the painting, just below the horizon line, was manipulated into various shapes with a painting knife. This produced random shapes, some of which were later added to to produce the figures. It was almost like looking for the figures in the jumble of shapes and by adding a spot of colour for a head, for example, a person emerged. Where a person was required and no shape existed, the lightest of strokes were placed. The format of how these strokes are applied should be dictated by the other ‘random’ marks so as not to have the figures ‘out of sync’. It requires practise and an opportunistic eye for potential details. Its a bit haphazard and can go terribly wrong, requiring repair work in the form of scraping off the misplaced paint and starting again. For a beginner, letting the layer dry and adding the paint onto the dry layer is a possibility, as any corrections can be made by wiping off the fresh paint as opposed to scraping off everything. This is one of the advantages of oil painting which makes it an excellent medium for beginners. I did not use Liquin in this painting. So the handling was more difficult with Linseed Oil only. For example, even a heavy layer of paint, with Liquin, begins to get ‘tacky’ shortly after its applied. If the paint is agitated, as in the blending of the sky colours, it can get almost ‘sticky’ allowing fine details to be painted on top. It almost drags the paint off the brush. With a Linseed Oil mix the brush picks up the colour rather than laying it down. So you will see me scraping the shapes into the sky to remove the paint before I apply the colour for the shed and the trees. If you are interested in this subject check the last few posts and the ‘For the absolute beginner, part 3‘ page. It is thought now that Irish boglands are not natural. Apparently the first settlers in Ireland were farmers (8,000 BC). At that time Ireland was covered in oak forests and the settlers set about clearing the land for agriculture. As the trees were removed an environmental catastrophe occurred. Bogland began to grow and spread covering large areas of agricultural land. In an area of North Mayo, stone-age settlements and field systems were uncovered when the turf was removed. The turf was used as a source of fuel over the centuries and turf cutting is still carried on in bogland areas. The chemical process which is responsible for the growth of the bogs produces an acidic environment. Its corrosive and machinery rusts quickly. Other items, like fencing, are bleached white. At this time of year the cutting is finished and the workers are busy collecting the sods which were cut and dried during the summer and autumn. The photo above does not do justice to the brilliance of the colours in this painting. The paints used are exactly the same as used in previous paintings (Burnt Sienna, Yellow Ochre, Prussian and Cerulean Blues, Raw Umber and Black and white) but the difference is I did NOT use Liquin. I have heard other painters saying they thought Liquin tended to dull the colours. Maybe its the particular scene, but these colours are glowing. Its years since I used Linseed Oil on its own but after a few minutes using it, I remembered why I began to introduce Liquin into the medium. The oil is ‘greasy’. It slips and slides all over the place. Placing a layer on top of a wet layer containing oil is nearly impossible. As you will see in the video (next post), trying to get a layer of ‘rust’ red onto the roof of the shed was like trying to butter hot toast. I also used a painting knife quite a lot in this painting. It helped with the difficult handling due to the Linseed Oil. I would still recommend Liquin for beginners. The ease of use counteracts the ‘possible’ dulling of the colours. Further to this, I dug out a painting I did a few months ago which was a ‘Liquin only’ painting and needed to be ‘oiled out‘. I ‘oiled out’ this painting with a mixture of Linseed Oil and White Spirits (50/50). The colours were more brilliant, after the oiling with this mixture, than they would have been using Liquin. This is the recommended practice before varnishing but it will take weeks to dry and months for this to be ready for varnishing. For me, it might be worth it. Check back in a couple of days for more on this painting and the time-lapse video of the process. Recently I was asked to clean an oil painting I painted in the mid 1980’s. The owner had it hanging over a fireplace for all of 25 years and it looked like an old master, not in a good way that is, but in a way that spoke of years of accumulated mahogany coloured smoke. It was framed without glass and relied on a layer of varnish for protection. After cleaning it looked great and I had it reframed – a frame is a piece of furniture and fashions change, so I got a more modern styled frame. This time however, I had it framed under glass. I think in this situation, over a fireplace, glass will allow the owner to clean the picture-glass as often as she likes, and not every 25 years by an ‘expert’. I was always bothered by varnishing an oil painting. Expecting an artist to “wait a year before varnishing” just seems extreme in todays world. Yet the technique is ancient, “so expect delays”. The issues with the modern additives like Liquin or other Alkyd media which speed up drying are at variance with varnishing. If speeding up the drying is such an issue that artist materials suppliers produce a substance for this purpose why do they still recommend we wait a year before varnishing. Since I started using Liquin I have been framing under glass. The painting is ‘oiled out’ with Liquin and no varnish applied. I’m not the only person doing this. Sally Chupick ( http://sallychupick.com) commented on my post about ‘oiling out’ saying this is what she does. My advise is, if you intend to varnish in the traditional way use only traditional materials (no Liquin or the like). 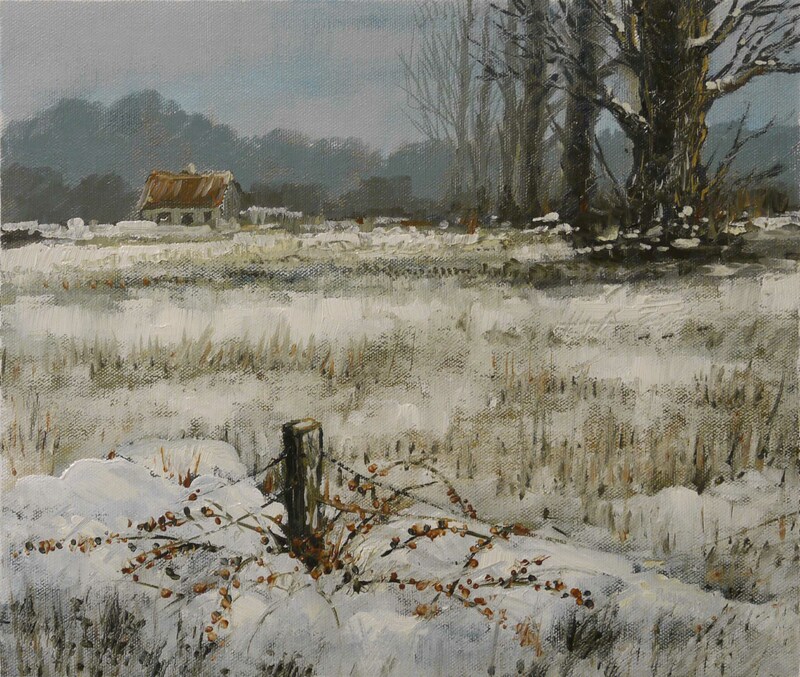 This is the video of the painting of ‘Brambles in the snow’. Before I actually got into the painting I flooded the surface with raw colour and White Spirits. This was allowed to evaporate with the help of a hair dryer. I must caution you about this practise. White Spirits is highly flammable. The vapour is explosive at high concentrations. The motors in electrical hair dryers are constantly ‘sparking’. Get the picture (excuse the pun). Ventilation, ventilation, ventilation. As I said in the previous post I did a lot of scraping and scratching with a palette knife to achieve a jagged, sharp look, in keeping with the theme of the painting. This got me thinking about texture and the beautiful tactile surfaces of oil paintings. It is sometimes overlooked by artists preoccupied with the image or the message they are trying to convey. A painting should be beautiful regardless of the message. Ugly may be ‘cool’ at the moment (‘hip’ for slightly older folk, ‘all the rage’ for older again), but the painting should’t be ugly. Think of Goya, horrific images from an horrific time, and yet the paintings are beautiful. This painting has nudged me in a slightly different direction, technique wise, and with my unease about the Alkyd media and varnishing, framing etc. I will do a bit of thinking before the next painting. The problem with paintings which are overly seasonal (this one is an example) is that they appear incongruous out of their season. This painting is about cold, bleak times and if hanging on the living room wall next summer, will be a little out of place. I have heard of people who change their hanging paintings with the seasons, especially at Christmas time. I can’t see anything wrong with this, but as an artist there is something unsettling about your work been packed away with the tinsel and fairy lights for 11 months of the year. Limited palette again, Burnt Sienna, Yellow Ochre, Prussian Blue, Raw Umber and black and white. 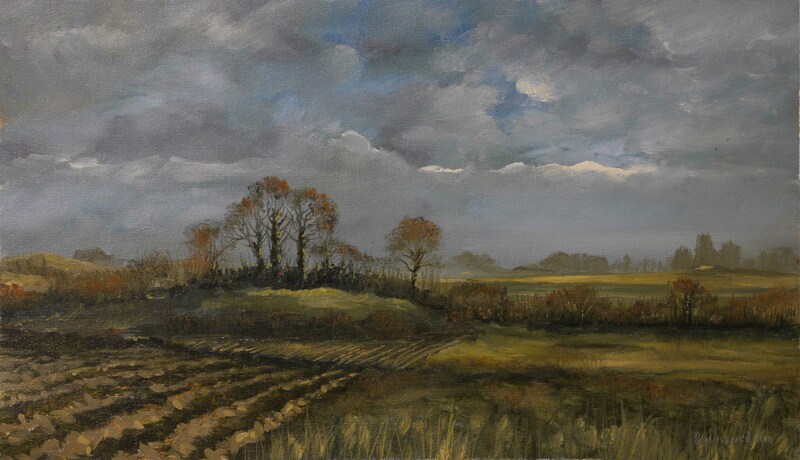 What is different with this painting is the attempt to contrast misty flat distance and the thorny, jagged brambles in the foreground. There is also a contrast in colours. Underlying the snow in the mid distance are warm colours and in the foreground the underlying colour is cold blue. The warm snow suggests the yellow stubble peeping through the light sprinkling of snow. The cold snow emphasises the flaming orange of the dead bramble. This orange colour (Burnt Sienna, Yellow Ochre and white) was introduced, almost randomly, into the rest of the painting and the roof of the cottage to disguise my manipulation of contrasting colours and integrate the brambles into the general scene. The snow colour was ‘scumbled’ onto the under colour. If you are not familiar with this, check out ‘Ráth – time lapse painting‘. I used a palette knife to scratch the paint surface and and give the painting a raw, brittle look. This texture I applied on foreground and mid distance to have consistency. I generally don’t like palette knife painting but this is a faster method of introducing suggested details than using a fine brush which also tends to produce smooth lines. Its an interesting method to try, but as mentioned previously it should be an integral part of the painting otherwise it might look like a mistake which was scraped off and overlooked in the repainting. As usual I videoed the painting process so you will see the painting/scraping in action. I will post the video in a few days, so come back and check it out. You have left your partially finished, or finished painting to dry for a few days and there are dull patches appearing which were not there before the painting dried. Check out ‘oiling out’ at For the absolute beginner, part 3 – the finished painting. A limited palette painting which is given vibrancy by allowing the raw colours of the underpainting to show through in several places. 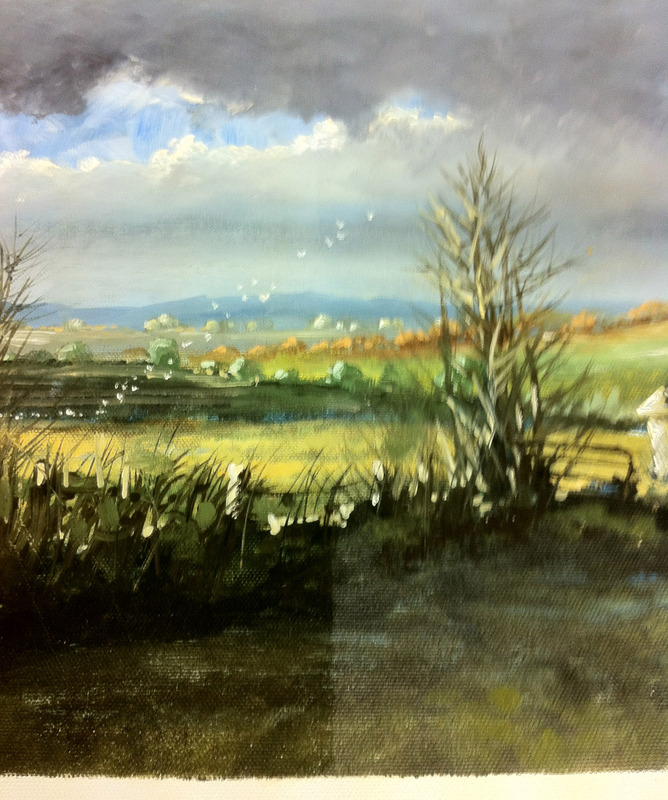 I do this very often in landscape paintings where there are large areas of what appears to be the same colour. A field of grass is one such example. I would not try and paint every blade of grass individually. This certainly would add interest and texture, if I lived long enough to complete it. Paint can be applied in 2 ways over an underpainting to allow it to effect the final appearance. Method 1 (Glazing): If the under colour is light in colour, as Yellow Ochre, a glaze can be applied when the yellow is thoroughly dry. This is usually a dark transparent colour, like Burnt Sienna, which is painted as a flat even layer allowing the variations in the underpainting to be seen. The resultant combination will be a mix of the two colours, but a colour which almost glows. The physical mixing of these colours will be a far less vibrant. The lighter colour underneath in the glaze reflects the light back through the upper layer and this is why it works better with the lighter colour underneath. Method 2 (Scumbling): In this painting, the second method is used. This is a more flexible method as a lighter colour can be applied over a darker colour and visa versa. The underpainting does not have to be completely dry, so it suits the alla prima painter. Its not like glazing. in that the upper layer does not completely cover the lower layer. Because of this the upper colour can be non transparent. This mix is dragged lightly over the underpainting leaving the under colour in the lower texture of the canvas, uncovered. In this painting, Prussian Blue was applied in the sky and the foreground. In the sky a lighter colour mix of Cerulean Blue, Prussian Blue, Yellow Ochre and white was dragged across the darker raw Prussian Blue. 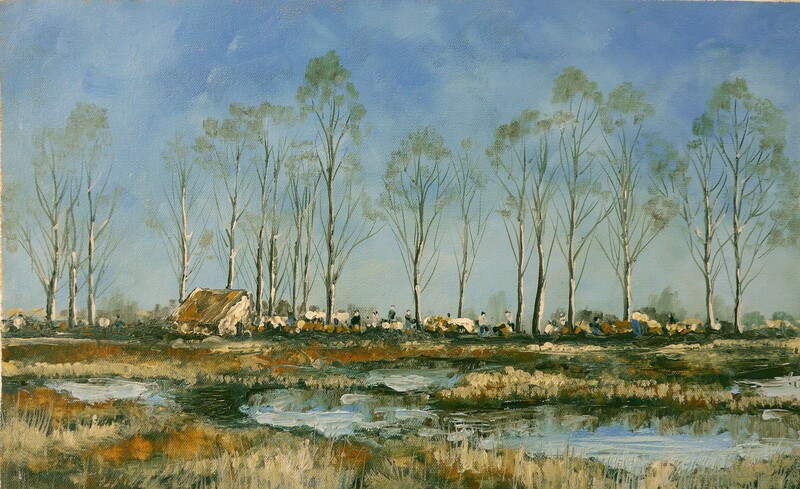 Later blending did cover the underpainting in places, but enough raw colour in the underpainting was left to give a variety and interest to the otherwise flat blue of the sky. In the foreground, a dark mix of Burnt Sienna, Raw Umber and Prussian Blue was dragged across the raw Prussian Blue underpainting but not covering it completely. Here, the fine brush used to paint in the grasses did cause a little blending of upper and lower colour, but the raw Prussian Blue can still be seen. Here is the video of the process. A Ráth, or ringfort is a defensive circular structure. Although it is estimated that there are about 40,000 in Ireland, thats an average of about 1 to every square mile in the country, why they were built, or when they were built is still debated. Most are at least 2000 years old and they were probably the Iron Age equivalent of the fortified house or castle. They have survived because land owners regarded them as sacred places and it was considered unlucky to interfere with them. Trees were never cut and usually become covered in Ivy and eventually fell down. There are many folk tales of Banshees, Little People and such like associated with Ráths. Unfortunately modern land owners, infused with the Euro obsession with efficiency and output have destroyed many of them. Ironically, the intensity of agricultural activity reached such a pitch (remember the meat, butter ‘mountains’) that the EU instructed farmers to leave a portion of their farms idle (set-aside) to try and counteract this intensive farming activity. No wonder the Euro Zone is a shambles with this sort of bureaucratic management. The colours in this painting are, wait for it, Burnt Sienna, Yellow Ochre, Prussian and Cerulean Blues, Raw Umber and black and white. Almost the same as used in the Absolute Beginners paintings, Part 1 and Part 2. As usual I’ve videoed the entire process for the next post and I will discuss the painting process then.